This gallery cart is designed to illustrate to the observer how the rapid advancement of transportation technology in the late 19th and early 20th centuries quickly transformed the lives of North Carolinians. 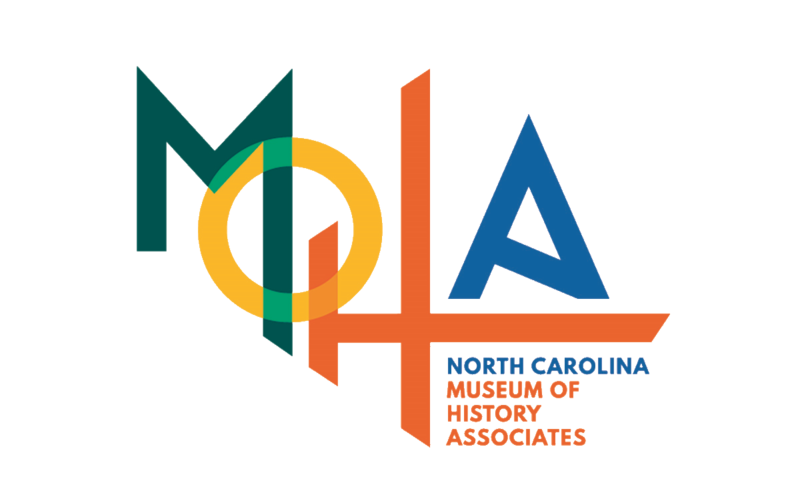 learn about several people who greatly influenced modern-day travel in North Carolina. be able to identify the ways in which lives changed as a result of innovations in travel and to recognize that, while these changes were generally beneficial, some changes perhaps had negative impacts as well. learn about advancements in both land and air transportation in the 20th century. As the 20th century dawned, scores of innovations in transportation were changing the way we lived. As the country embraced these advances, North Carolina also adapted and contributed to the transition from old to new. The biggest leaps in transportation innovation were on land and in the air. Many individuals from North Carolina played major roles in the development of new ways to travel and we are going to meet some of those people today. In the 1700s, North Carolina’s first transportation systems developed along existing local trade routes—often rivers and streams or narrow dirt trails. By the mid-1800s canals, improved trails, and railways began to expand these systems. These expansions allowed farmers to move their crops and produce to markets that were farther away and enabled merchants to provide goods and services to additional customers. As railroads became even more widespread, these trends stretched farther into the state, facilitating additional growth, more businesses, and larger industries. As businesses and industries thrived, they attracted workers from outlying, rural areas, thus prompting the process of urbanization. As people moved into cities for work, the new residents faced two issues: they had to be able to move around in their urban environment and they had to be able to get food and other goods from farms and markets in the country. Several transportation solutions were the result. Horse-drawn streetcars were one of the first solutions that allowed people to work in the city and live just outside the busy urban center—without having to walk or ride a horse, that is. Bicycles became hugely popular in the 1890s because they were the first personal mechanical mode of transportation that allowed individuals a great sense of freedom. Around 1900, an occasional automobile and truck began appearing on streets. Shortly after, city streets were teaming with pedestrians, bicycles, horse-drawn wagons and carriages, streetcars, and a rare gasoline-powered vehicle, all fighting for the same space. Special Features: Combined a horse-drawn buggy frame with a gasoline-powered engine. Tires were solid rubber. After seeing a steam-powered automobile during a trip to Baltimore in 1899, buggy manufacturer Gilbert S. Waters returned to New Bern determined to try his hand at designing one. The result was a prototype gasoline-powered vehicle known as a buggymobile. His first buggymobile, which was up and running by the year 1900, was possibly the first car made in the South. Unfortunately, the local community did not readily accept the buggymobile. In general, people thought it was too dangerous and too noisy. Many also thought that cars were just a fad for the wealthy. Waters could not find anyone to invest money in his automobile scheme. Without funding, Waters continued working in the family business, producing traditional horse-drawn buggies, for a number of years. Interestingly, when the demand for those vehicles finally disappeared, Waters began working in the automobile tire and accessory industry. The vehicle on exhibit is actually Waters’s second buggymobile, built in 1903, though he reused the engine from his first car. Waters drove this buggymobile until he was in his late seventies. Cars eventually proved reliable and convenient, and more people started wanting them. In the first decades of the 1900s, hundreds of manufacturers were producing small quantities of cars that varied in cost and quality. From 1910 to 1914, Henry Ford introduced the assembly line concept at the Ford Motor Company. With this fundamental element of mass production in place, automobiles became more affordable and their quality became more standard. Millions of people, including farmers, purchased Ford’s Model-T cars and trucks. By the 1920s, cars were taking over the roads and rendering older modes of transportation obsolete. But what about those roads? (Image of car stuck in the mud) See below. People began pushing for better roads around the mid-1800s but little changed until the early 1900s, when the prevalence of cars and trucks with thin, rubber tires could not travel some roads because of deep muddy ruts. (Image of Harriet Morehead Berry) See below. Berry was born in Hillsborough in 1877 and entered the State Normal and Industrial College (now UNC–G) in 1893. She graduated and taught a few years, then joined the staff of the NC Geological and Economic Survey in 1901. She was appointed secretary of the survey in 1904. In 1906, Joseph Hyde Pratt became state geologist of the survey and secretary of the North Carolina Good Roads Association. Pratt and Berry soon began promoting the idea, across the state, that North Carolina needed and deserved better roads. Pratt joined the army in 1917, for service in WWI, leaving Berry the acting head of the survey and the Good Roads Association. Bear in mind, this was before women even had the right to vote in this country! In spite of that, this woman was in charge of two state agencies and about to push a major piece of legislation through the state General Assembly. Her first attempt at legislation failed to pass in 1919, but she did not give up; she set about organizing a statewide grassroots campaign to get the bill approved by the 1921 legislature. During those two years she traveled the state, speaking about the need for better roads, increasing membership in the association (from 272 members in 1919 to 5,500 in 1921), and building the association’s treasury (from less than $2,000 to more than $12,000). Many, including then-governor Cameron Morrison, opposed her plan because it included using tax money from wealthier counties to help build and maintain roads in poorer, less populated, rural counties—she wanted the program to be financed by raising auto license fees, taxing gasoline, and issuing bonds as needed. Morrison tried to keep the wealthier counties from having to pay more and suggested that each county pay for half the cost of building and maintaining its own roads. Under Miss Hattie’s guidance, the 1921 legislature did pass a state highway system act. It created a powerful state highway commission and committed North Carolina to the construction of a state system of modern highways, funded primarily with Berry’s suggested program of state funding. The new law was a success and earned North Carolina the “Good Roads State” nickname. In spite of her success, Berry made enemies along the way. She lost her position with the state geological survey but later continued in public service by helping to promote the state, improve schools, and organize credit unions and savings and loans associations throughout the state. Since her death in 1940, she has been remembered as the Mother of Good Roads, in recognition of her hard fight to get North Carolinians out of the mud. Asphalt. In order for roads to be passable by cars, they had to be stable, relatively smooth, and made of a material strong enough to stand up to the weight of automobiles and trucks. One of the materials we use today is asphalt. Asphalt is a semi-solid waste material that is left over after the manufacture of gasoline, kerosene, and diesel fuels from crude oil and petroleum. This material is used to bind other elements like crushed stone, sand, or gravel. Have visitors observe the chunks of asphalt on the cart to see if they can recognize some of the elements like crushed stone or gravel. license plates: (1) early license plate from 1933, (2) 1942 public school bus plate, (3) 1975 “First in Freedom” plate commemorating the bicentennial of the signing of the Mecklenburg Declaration of Independence. North Carolina first required residents to register their motor vehicles and display license plates in 1913. At least some of the fees paid for plates went to help fund highway transportation improvements—especially after 1921’s “good roads” act. In 1975 the state issued commemorative license plates like this one to celebrate the bicentennial of the Mecklenburg Declaration of Independence. The slogan “First in Freedom” recognized the Mecklenburg Declaration as the colonies’ first declaration of independence from Great Britain. It was allegedly signed on May 20, 1775—more than a year before the thirteen colonies united in one “official” Declaration of Independence on July 4, 1776; allegedly, because no documentation for the document’s existence has ever been found. Because so much controversy exists over the actual existence of the “Meck Dec,” as it is sometimes called, the slogan was eventually removed from the state’s license plates. (The date of the Mecklenburg Declaration does, however, remain on the state seal and the state flag.) In spite of the Meck Dec controversy, North Carolina does still have the right to claim its first-in-freedom moniker. Primary to supporting this claim were a number of resolves, or resolutions, that were debated, drafted, and signed in communities across North Carolina in 1775, after battles between colonists and Great Britain at Lexington and Concord in the Massachusetts colony. As one example, the Mecklenburg Resolves (not to be confused with the Mecklenburg Declaration) were drafted in late May 1775 and adopted on May 31, about a month after the two battles took place on April 29. Similar lists of resolves were issued by other localities over the next several months and included the Liberty Point Resolves that were adopted on June 20, near Cross Creek (present-day Fayetteville), and the Tryon Resolves that were signed on August 14. Documents that protested Great Britain’s treatment of the colonies had become common throughout the colonies, but these North Carolina resolves were among the first proclamations to go farther than protesting taxes and other single acts of the British government and to suggest taking a stand to correct grievances instead of expressing a desire for discussion and reconciliation with the crown. The second event that supports the state’s claim was the Battle at Moore’s Creek Bridge on February 27, 1776. During this battle, 1,000 Patriots from North Carolina defeated a larger contingent of British Loyalists and launched the struggle for freedom and independence in the southern colonies. The victory at Moore’s Creek Bridge essentially ended British control of the colony and boosted morale and confidence in the south, just as the battles of Lexington and Concord had in the northern colonies. The victory also influenced North Carolina to be the first colony to vote for independence. That vote came as North Carolina’s third rightful claim to “first in freedom”: the Halifax Resolves. On April 12, 1776, the Halifax Resolves were passed by the Fourth Provincial Congress of North Carolina and gave the colony’s delegates to the Second Continental Congress, in Philadelphia, the right to vote for independence from Great Britain. This was the first official authorization from any of the colonies that encouraged a stand for total independence. The Halifax Resolves did not authorize the delegates to introduce a resolution that called for independence; it only authorized them to support such a resolution if one was already in discussion. The resolution they were able to support was presented by Richard Henry Lee of Virginia. The Lee Resolution became the first act of the Second Continental Congress declaring the American colonies to be free and independent of British rule. One final, additional claim to the “first in freedom” nickname was North Carolina’s First Provincial Congress. This gathering, which met at the Tryon Palace, in New Bern, from August 25 to 26, 1774, was the first governmental gathering in any of the thirteen colonies that was not sanctioned by the British crown; in fact, it was held in defiance of British orders. The First Provincial Congress of North Carolina consisted of 71 delegates from 30 of the 36 counties. Its actions included approving the organization of the First Continental Congress and electing three delegates to that congress: William Hooper, Joseph Hewes, and Richard Caswell. North Carolina is one of several states that use prison labor to make their license plates. Starting in 1927, the first metal plates were made at Central Prison, in Raleigh, by male inmates. In 2001, the license plant was moved to the Correctional Institution for Women, also in Raleigh. Since that time, all of our license plates are made by female inmates. As more people started owning and operating cars, it became necessary to implement and standardize traffic laws and road signage. In addition, drivers started being required to register their vehicles, obtain a driver license, and secure a license plate. In fact, part of Harriet Morehead “Hattie” Berry’s plan to raise money for new roads and road maintenance was to raise the cost of license fees and tag fees. In just a few decades, as highway systems expanded, our landscapes and our way of life began to change. Here are a few ways that automobiles changed our culture. How are these changes positive? Have any of the changes been negative? New businesses, like tire shops, gas stations, and auto mechanic’s garages, created new jobs to serve automobile owners. Businesses began to place their buildings away from streets to allow for parking. Suburban neighborhoods popped up on the outskirts of cities and towns. Children began traveling by bus to go to larger, better equipped schools that were several miles from their homes. People could traverse greater distances in shorter amounts of time. More cars and better roads depended on the use of more and more fossil fuels for gasoline, tires, and road construction. The demand for more oil led to oil spills from wells and ships transporting crude oil. Improper disposal of used oil led to pollution of ground water. More cars, trucks, and buses led to air pollution. Can you think of other negative factors? The most significant achievement in flight at the turn of the century is attributed to the Wright brothers. Wilber and Orville Wright were bicycle makers in Dayton, Ohio, but were fascinated by the possibility of flight. The brothers began their experiments with flight at a young age, first studying the work of others, then experimenting with different designs for a variety of gliders that they created. When looking for a place to test their gliders, the brothers consulted the US Weather Bureau’s tables of wind measurements from around the country. They determined that Kitty Hawk, North Carolina, was the optimal location: it was fairly accessible by train and had fairly constant high winds, soft sand for landings, relative isolation for testing, and local residents who were willing to help them. Wilber and Orville first came to North Carolina in the year 1900, making regular trips over the next few years to test their gliders as they modified them to do different tasks. Back in Ohio, the brothers continued to perfect their aircraft by collecting data on lift, air pressure, drag, and airflow in a homemade wind tunnel. While experimenting with designs, Wilber discovered the idea of “wing warping”—twisting the wings of an aircraft to exert lateral control. The brothers implemented cables into the design of their gliders to account for wing warping, thereby allowing them to control the direction of flight. In 1902, they had several successful flights with their gliders and determined the next step would be to add power. narrow box- Twist the box to demonstrate how Wilber discovered wing warping. Today, wing warping is adjusted with flaps on the wing called ailerons. In 1903 the brothers returned to North Carolina, to Kill Devil Hills, a town a few miles from Kitty Hawk, with their powered airplane, the Flyer. The plane consisted of spruce poles, baling wire, muslin fabric, and propellers attached to an engine with a bicycle chain. On December 17, 1903, Orville made the first successful powered, controlled flight. It lasted 12 seconds and traversed a distance of 120 feet. Later that day they achieved a more successful flight that lasted 59 seconds and traversed a distance of 852 feet. What do you think made this particular flight so significant? The flight of the Flyer was significant because the Wright Brothers were able to sustain flight with a powered, heavier-than-air machine while the pilot was able to maintain complete control of the flight path and landing. The brothers founded the Wright Company in 1909 to build, demonstrate, and sell their planes. Also that year, the US Army purchased the first military plane from them for $30,000. The possibilities of using airplanes for combat prompted rapid improvements in airplane design over the next few years, and just 11 years after the Wright brothers’ first flight, planes were being used in World War I. They were initially used to collect information, primarily through photography and mapping, but they later became useful in combat and were used to shoot at enemy aircraft and to drop bombs on land targets. During World War II, the Army Air Corps continued the use of planes in combat, and in 1947 the US Air Force was formed. Air shows became popular shortly after the Wright brothers perfected airplane control. In fact, they were among the earliest spectacles, themselves, as part of doing tests, demonstrations, and sales pitches. Daredevil aviators, known as barnstormers, made entire careers, entertaining audiences and showing off their talents with dangerous stunts in the new contraptions. One famous barnstormer from North Carolina was “Tiny” Broadwick. Tiny was born Georgia Ann Thompson, in Oxford, Granville County, but gained her nickname due to her small stature—she was just over 4 feet tall and only weighed 80 pounds! Tiny began her career by performing stunts from a hot air balloon at the 1908 North Carolina State Fair with Charles Broadwick, who became her mentor and later adopted her. In 1914 Broadwick convinced her to try parachuting. Tiny’s new act made her the first woman to parachute from an airplane and the feat garnered her immediate success. She also demonstrated the effectiveness of parachutes to the government in 1914 as a method of escape for pilots. She is known today as the First Lady of Parachuting. Tiny Broadwick’s jump suit in the exhibit. Measuring tape to mark her height. Use this to compare her height with those of some students at the cart. By 1948 commercial air travel was becoming fairly commonplace, and North Carolina–based Piedmont Airlines began operating from Wilmington, with through service to Pinehurst, Charlotte, Asheville, Tri-Cities (Bristol, Kingsport, and Johnson City in northeastern Tennessee), Lexington, and Cincinnati. The airline eventually extended service north to New York, west to Denver and Dallas, and south to Miami. Ultimately, Piedmont would serve London, England, before being sold to USAir in the late 1980s. In 1966, three years after the first major airline carrier (Continental Airlines) was forced to hire an African American pilot and desegregate airline flight teams in the United States, Piedmont Airlines hired its first African American pilot, Warren Wheeler. It hired its first female pilot, Cheryl Ritchie, in 1974. Warren Wheeler was born in Durham in 1943. He attended North Carolina A&T State University for a brief time but left to pursue his dream of becoming a pilot. That dream was not possible in North Carolina during the 1950s because of racial segregation. So Warren went to the American Flyers School in Ardmore, Oklahoma, where he was the school’s first African American student and first African American graduate. At the age of 19, in 1962, he was fully accredited and licensed to fly multiengine planes! That same year, Warren returned to North Carolina and opened a small flying school, bought his first plane, and started a charter business. After acquiring enough hours of flight time, he tried to get a job with one of the major airlines of the day, but found that his race was still a huge obstacle. Fortunately, one of his earliest passengers on his charter plane was former governor Terry Sanford. Sanford recommended Wheeler to the president of Piedmont Airlines, Tom Davis. Davis allowed Wheeler to take a pilot examination and in March of 1966, Wheeler became the first African American pilot that Piedmont Airlines hired; he was also one of the youngest. Wheeler later became the first African American to own a commercial air carrier, in 1969, when he founded Wheeler Flying Service. 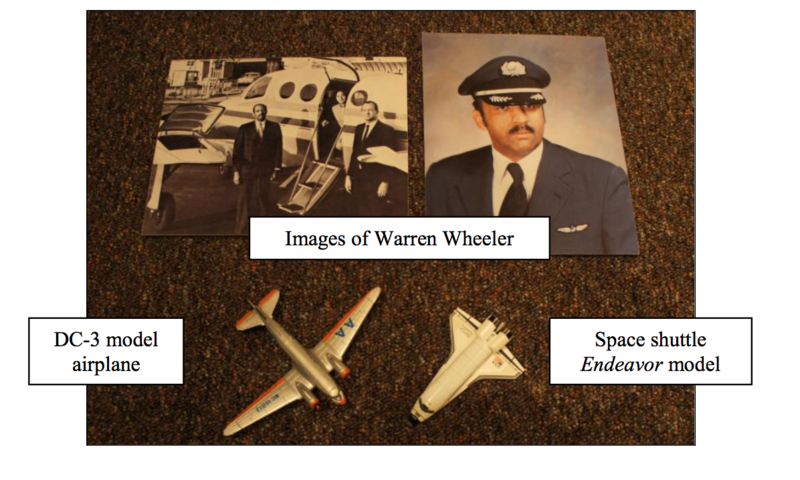 His new company was promoted as an air cargo, charter, and aircraft maintenance service and was the parent company for what became Wheeler Airlines. He flew about 8,000 passengers annually in the early years of his company and about 40,000 passengers a year by the 1980s. During this time, Wheeler Airlines was the only minority-owned airline in the United States. He also trained numerous African American pilots, copilots, and aircraft mechanics with the goal of encouraging more minorities to seek employment in the field of aviation. In 1989 Wheeler became a pilot for USAir. Two years later he became chair of Virginia’s aviation board. Captain Wheeler closed his airline in 1991 due to the unstable economy, but he was proud that he had owned and operated the country’s first African American airline for 22 years. He lives, today, in the Virgin Islands and continues to fly. DC-3 model airplane- The DC-3 airplane was used in World War II and became one of the first commercial passenger planes. Three used DC-3 planes were used when Piedmont Airlines began service in 1948. From the Wright Flyer to parachutes to the DC-9, North Carolina has been a part of aviation technology, which eventually paved the way for space exploration. Using simple tools such as the slide rule and abacus, NASA scientists performed intricate calculations that allowed Apollo 11 to successfully land on the moon on July 20, 1969, just 66 years after the Wright brothers’ first powered flight. Sixteen years after that landing, in April 1985, North Carolina astronaut Dr. William E. Thornton took fragments of the original Wright Flyer into space with him aboard the space shuttle Challenger. Those fragments are now on exhibit here. In January 1986, nine months after Dr. Thornton’s flight, the space shuttle Challenger exploded a minute after liftoff, killing all crew members. The pilot was Michael Smith, a native of Beaufort, Carteret County. Dr. Ronald McNair, a native of South Carolina and graduate of North Carolina A&T State University, was also aboard the Challenger. model of space shuttle Endeavor, which was built in 1987 to replace Challenger. Endeavor began flying in the 1990s and made its final flight in May 2011.